The Blue Angel Hosta (Sieboldiana) produces heart-shaped, wavy, blue-green leaves that will continue to grow all summer long. This hosta can grow up to 18-30 inches tall and 3-4 feet wide. Its' tall white flowers will appear in mid-summer. This low maintenance plant is ideal for the beginner gardener. Try planting in a woodland area or as a border plant. 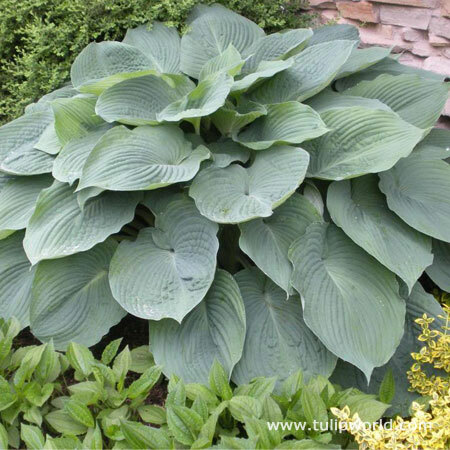 Also, try planting with other hostas and green plants. Tip: Their giant leaves help to suppress weed growth!